It?s been a shocking week for Man City on the injury front. On Thursday, Man City confirmed everyone?s worse fears for French international Benjamin Mendy. The left-back, who has been so impressive in the first weeks of his Premier League career, is now out for many months. Mendy ruptured his ACL playing against Crystal Palace last weekend. He?s set to be out of action for the next nine months. Bad news guys ? ll be joining Injury FC on loan for a couple monthes with ruptured ACL? but will be back soon & stronger hopefully ?? But on Friday it?s got a lot worse for Man City and Pep Guardiola as it?s been confirmed that Sergio Aguero has been badly injured in a horror car crash in Holland. Man City star in Holland. Aguero, 29, was a passenger in a taxi en route to the airport in Amsterdam after attending a concert on Thursday night put on by Maluma, a Colombian singer, when the driver lost control of the vehicle and hit a column on the side of the road. 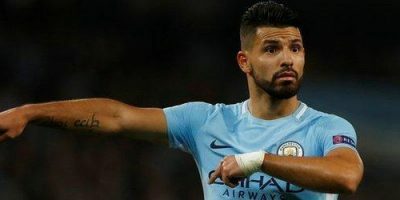 The sources said that Aguero could miss six to eight weeks because of the injury, which would initially rule him out for Saturday?s Premier League clash with Chelsea and a crucial pair of World Cup qualifiers for Argentina next week. It?s believed Aguero suffered broken ribs in his car accident. Pictures from the incident show how Aguero?s car wrapped itself around a lamppost. The car ended up looking like it has been crushed like a tin can. Gabriel Jesus will be a certain starter for Man City this weekend in their away match at Chelsea in the Premier League on Saturday night. It?s worth noting that Aguero remains just one goal shy of equal Eric Brook?s all-time Man City goalscoring record. Aguero missed the chance to chalk up his 177th goal for the Sky Blues in the Champions League when his second half penalty was saved by Andriy Pyatov. The Argentine will now have to wait a fair while longer to reach that landmark goal.